The term “Service economy” has changed the mindsets of companies’ strategic thinking in the 21st century. It reflects from the fact that in industrialized economies, manufacturers are focusing more and more on add-on services when trying to defend their business against the continuously growing service sector. Market is a battlefield and new challengers are entering from every corner. Markets are changing rapidly and constantly forcing companies to challenge their existing business models. Today many of the startup companies are founded on the basis of innovative service concepts, aiming to create their own market and challenge the structures of traditional business competition. This blog post focuses on providing a strategic roadmap to startups on their journey to become a forerunner in service business. New companies should have in mind from the very beginning the possibility that their service can become a platform for others to work on. For a startup this gives the opportunity to benefit from co-creation of other companies and users. Advantage comes from not needing to invest heavily on R&D and production lines because the development is made by the community of users and the production (if needed) already exists. “Strategy Canvas” (Figure 1) can serve as a fundamental tool to visualize ones position against the competitors and as well to discover differentiators (in order to attract unexplored market). The challenge lies in finding the relevant factors and parameters of the service or product which defines or affects your area of business. Many of the factors can be directly mapped from the competitor’s business space. The parameters can be studied to finalize the positioning focus, either low or high against the competition market. 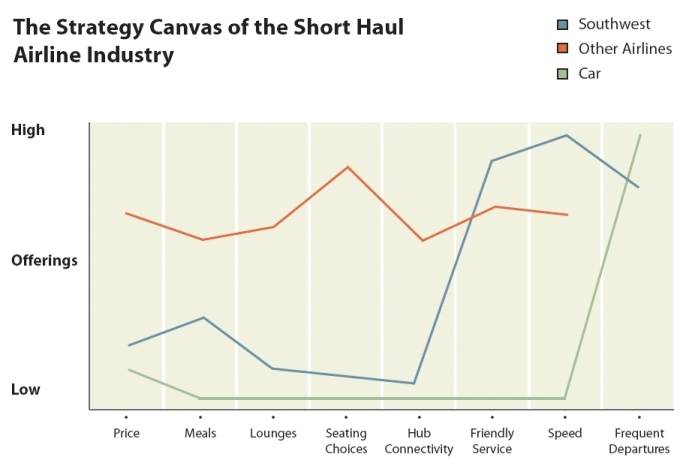 The figure 1 as a sample shows factors like price, meals, speed etc, for the airline industry and canvas is sketched as low or high for all the competition (either from the same strategic group like “other airlines” or the alternate like “car”). Once the current strategy canvas is sketched, organization can make use of eliminate-reduce-raise-create grid to sketch the future or expected strategy canvas. The grid simply allows you to change the positioning focus (low or high) based on the relevance of a factor. The organization has a flexibility to eliminate a factor totally, reduce the focus of factor (high towards low), raise the focus of factor (low towards high) or create a factor based on market study and business need. The extreme importance should be given to the term co-creation. The best of service companies have given state of the art services by co-creating value along with employees (internal customers) and end consumers. The building blocks of co-creation are Dialogue, Access, Risk assessment and Transparency also known as DART. Dialogue means interactivity, deep engagement and a tendency to act by the consumer and the firm. Dialogue is not only listening to customers rather it requires understanding them. Access is to give a chance to a customer to experience. An example to this can be that some companies inform and show their whole manufacturing process to their interested customers. Risk assessment is the investigation made by a company to find the probability of harm to a customer from its product. Customers’ involvement in the risk assessment is very crucial. Since the customers are involved in the risk assessment process, they share the responsibility to dealing with risks. Companies are becoming less secretive about prices, costs, profit margins, products, technologies and business system. This is desirable by the consumers and shows the transparency of firms. There are three types of co-creation experiences. The one-to-one experience is the process where a single consumer interacts with a single firm while one-to-many is a single firm interacts with consumer communities. The third type of interaction is between multiple firms and multiple consumer communities which is called many-to-many. The complexity of the consumer-firm interaction increases while moving from one-to-one to many-to-many. 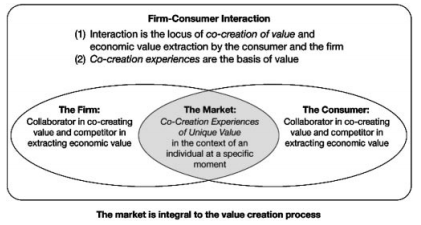 “The future of competition, however, lies in an altogether new approach to value creation based on an individual-centered co-creation of value between consumers and companies”. (Prahalad & Ramaswamy 2004,12). To be strategically agile, there are three stages/concepts to be taken into consideration. Strategic sensitivity is the constant alertness, awareness of what’s going on around you, constant mental sensitivity and agility, constant questioning. This means involving all stakeholders (employees, customers, non-customers, end-users, partners, substance experts) in developing the business strategy. Collective commitment is the top team’s ability to make collective decisions and commitments regarding the strategic direction of the company. Each company should find its way to develop integrative and collaborative programs between all its business units and functions based on its organizational type. Resource fluidity is the idea of “going out of the comfort zone” which most people and organizations avoid. Resource fluidity will convert the business unit’s narrow view to a more broad corporate objectives and targets that will result in more integrated business solutions, new ideas to be developed for future plans. New entrepreneurs seem to lack business acumen. So, this blog post advices to put green (creativity) hat on and challenge your current business model. Now is the time to think and develop your service as a platform by sketching the differentiating strategy canvas. Take a big leap in the market by co-creating the service with customer and adopting agile methodologies during development. This blog isn’t a guarantee to achieve anything but gives you good pointers to start. So, gather all the ideas you can and start working on them. How did you find the tips? What was left out? Feel free to comment and share your ideas and insights on topic. Chesbrough, H., 2011. Open Services Innovation: Rethinking Your Business to Grow and Compete in a New Era. Jossey-Bass. Hamel, G., 2000. Leading the Revolution. Harvard Business School Press. Prahalad, C.K. & Ramaswamy, V. 2004. The Future of Competition: Co-Creating Unique Value with Customers. Boston. Harvard Business School Press. Doz, Y. & Kosonen, M., 2008. Fast Strategy: How strategic agility will help you stay ahead of the game. Pearson Prentice Hall. ← Are you a Designer? Thanks for the comment. Please let us know if we can help you understanding any of the topics.